The D-backs came out swinging in Thursday night’s matchup against the visiting Chicago Cubs. Behind a 10 hit outburst, the home team cruised to an 11-2 win in game one of the four-game series. In the opening inning, the D-backs scored early and often against Cubs starter Ryan Dempster. Dempster would last just a third of an inning as the D-backs exploded for seven runs on four hits and four walks. It was the 20th seven run inning in team history. Chris Young got things started by rocketing a Dempster offering into the left field corner for a standup double. Kelly Johnson and Justin Upton both reached base via a walk and hit by pitch to load the bases. One batter later, Stephen Drew provided the striking blow by smashing his first career grand slam into the right field bleachers. 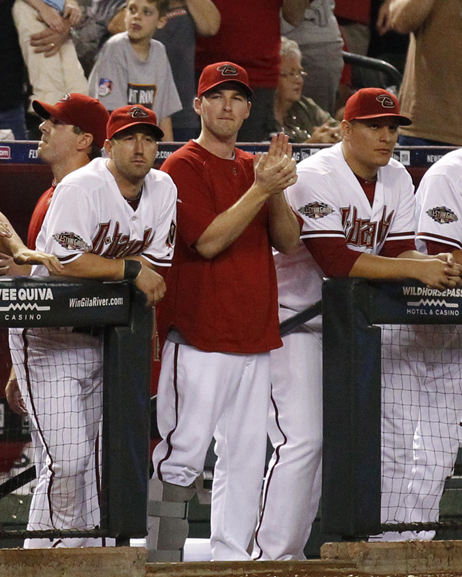 Dempster struggled mightily with his command, and the D-backs made him pay. After Melvin Mora, Russell Branyan, and Gerardo Parra all walked, pitcher Barry Enright smacked an RBI single to right centerfield to plate Mora. The D-backs collected nine walks in the game. In Young’s second at-bat of the inning, he laced an RBI single into left field to extend the Arizona lead to 7-0. With Young’s two hits in the same inning, it was the 23rd time a D-backs player had collected a pair of hits in the same frame. In the bottom of the second, the offensive outburst continued thanks to a leadoff single from Drew and Miguel Montero’s RBI double. Arizona tacked on to its lead in the third on a two-run blast off the bat of Montero. The homer was his fourth of the season, and pushed the D-backs to a 10-1 lead. Drew knocked in another RBI in the seventh for the D-backs’ 11th run of the night. With that RBI groundout, Drew set a new career high with five RBI in a single game. In his first four starts this season, Barry Enright struggled to put together an all round solid effort. He entered his Thursday start with an 0-2 record and a 6.65 ERA. The struggles on the mound came to an abrupt halt for Enright against the Cubs. The righthander cruised through the game’s first four innings, allowing just a solo home run to Cubs catcher Koyie Hill. He set the Cubs down 1-2-3 in both the second and fourth frames. Enright ran into trouble in the fifth when he walked three Cubs hitters to load the bases. He got out of the jam unscathed when Upton made a diving catch in right field to end the inning. Later in the sixth, Enright’s defense helped him out yet again with a pair of phenomenal defensive plays from Mora and Parra. Enright then struck out Carlos Pena to end the inning and seal his third 1-2-3 inning of the night. He hurled 6 2/3 innings of two-run baseball to earn his first win of the season. Enright believes he was able to make some necessary adjustments after watching film of his past starts. D-backs reliever Josh Collmenter took over for Enright in the seventh inning and kept the Chicago bats quiet for the remainder of the game. In the ninth, the right-hander struck out Tyler Colvin to start the inning. He then retired Hill on a fly out to left before getting the pinch hitter Darwin Barney to ground out for the final out. Collmenter did not allow a single hit in his 2 1/3 innings of work. He fanned three batters while walking just one.